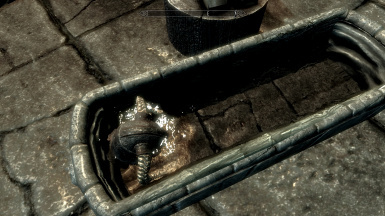 Now all forges SkyForge in Whiterun included will finally have real water, not a static/barely animated texture. Finally added long awaited Hearthfire player house forges support! Re-arranged the whole distribution. Single archive to download. Finally fixed wrong filename for the English strings. I apologize. Fixed multilanguage. Embedded english original strings. For other languages should use external Strings. Now multilanguage. Please help me and provide your own language strings I'll include in the archive. 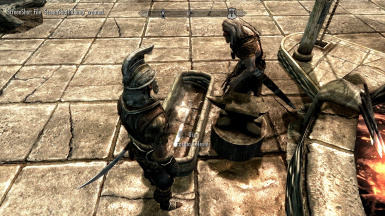 Some modders have tried with decent workarounds giving some forges (not all of them) a fake pseudo-animated water texture. 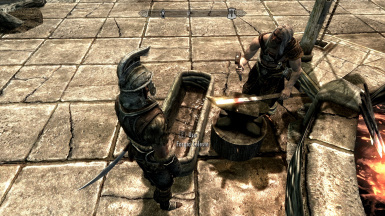 This mod finally adds real water for ALL the blacksmith forges across Skyrim, SkyForge at Whiterun included! 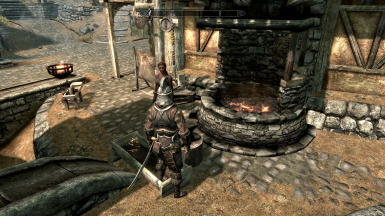 One of the oldest Skyrim gfx (minor) issues finally has a solution. 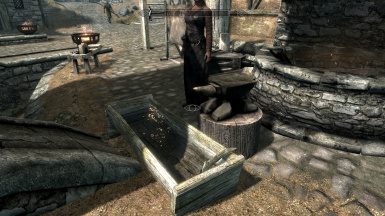 Moreover these "water-troughs" finally have a realistic collision (totally missing in vanilla), so... yes, you can even drop daggers into them or put your feet in some cold water for a quick refresh (hey I'm joking, didn't modify the game mechanics with new bonuses of course!). Supported languages: Eng, Ita, Ger, Fr, Spa. Beware! 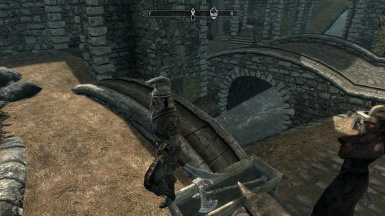 Don't use mods which modify forge positions (e.g. 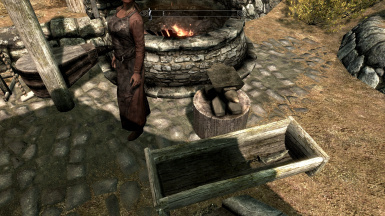 some mods that make Riften etc. "more beautiful"...): this mod works overlapping the water in the troughs only if the original positions are kept!